Politics • Utah's lone Democrat in Congress says he needsto be in Utah; Republicans say he's distancing from Obama. Al Hartmann | Tribune file photo Saratoga Springs Mayor Mia Love and U.S. Rep. Jim Matheson, contenders in Utah's new 4th Congressional District, appear at a recent Utah Taxpayers Association conference. 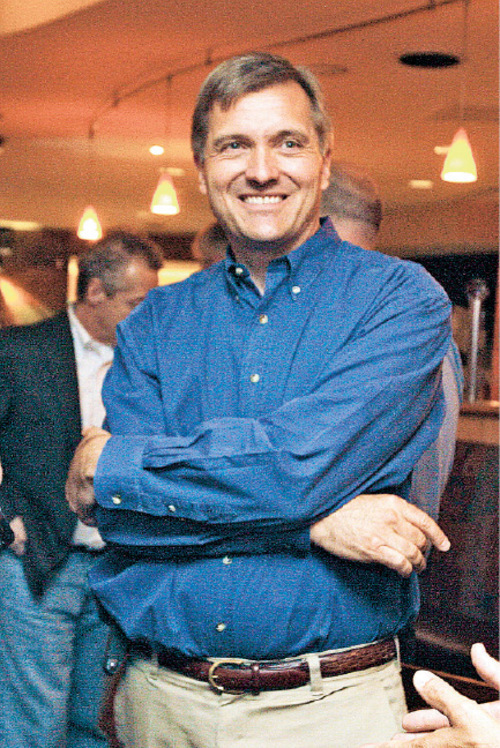 Leah Hogsten | Tribune file photo Rep. Jim Matheson is keeping up his tradition of not attending the Democration national convention. Washington • Rep. Jim Matheson has never attended a Democratic national convention and he isn't starting this year, joining a growing list of moderate politicians who won't be in Charlotte this September to see President Barack Obama accept his party's nomination. "I'm not going. This is an active election year in Utah and I want to spend time there," Matheson told The Salt Lake Tribune on Thursday. The six-term incumbent, and the highest-ranking Democrat from Utah, faces a tough challenge from Republican Mia Love, the mayor of Saratoga Springs. They are competing in a newly drawn 4th Congressional District and their race has already garnered broad attention along with promises from the national parties of $1 million ad campaigns. Republicans pounced on Matheson's decision, saying he is skipping the convention to distance himself from Obama, who is not popular in Utah. "Matheson can run, but he can't hide his record of supporting Obama's policies and reelection," said Daniel Scarpinato, spokesman for the National Republican Congressional Committee. Matheson, who has said he will support Obama in November, said he plans to stay in Utah to counter Republican accusations, which he argues skew his record. "I'm going to be involved in what is going to be an interesting campaign back home and I'm anxious to spend as much time as I can to make sure people know exactly who I am," he said. While Matheson is skipping his party's convention, Love is not only expected to attend the Republican gathering in Tampa, Fla., but is widely rumored to have a speaking role, in part because of her potentially history making candidacy. If she beats Matheson, she will become the first black Republican woman elected to Congress. Utah Democrats stand behind Matheson's decision, with state party Chairman Jim Dabakis saying: "Jim's highest priority is to be with Utahns and get reelected as Utah's only truly independent representative in Washington." The party faithful were not as forgiving when Matheson skipped the 2008 convention, where Obama became the first minority to accept the nomination of a major party. "This is a milestone worthy or recognition and celebration," state Sen. Ross Romero said at the time. "I would be a little disappointed if he did not attend as our state's highest elected official." Matheson's re-election was not seriously in doubt in 2008, which spurred some of the frustration. He also skipped the Democratic conventions in 2000 and 2004, when he had stiffer competition. He appears to have some company this go around, as other vulnerable Democrats have recently announced that they are staying home, among them are West Virginia Gov. Early Ray Tomblin and West Virginia Sen. Joe Machin, who has repeatedly distanced himself from the president. A trio of House members who recently won their seats in special elections plan to stay home and campaign as well: Reps. Kathy Hochul and Bill Owens of New York and Rep. Mark Critz of Pennsylvania. Critz's campaign spokesman told The Pittsburgh Tribune-Review the decision to avoid the convention was "pretty easy" since Obama trails Republican candidate Mitt Romney by double digits in that congressional district.